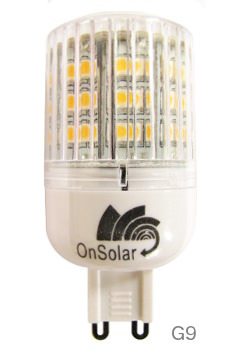 Ideal for Off Grid Home, Solar, Boats, Garden, and Caravans. A modern 'A rated' compact LED lamp ideal for a huge range of low voltage lighting applications where a good level of light, robustness and long life is required (with, of course a very low energy consumption). 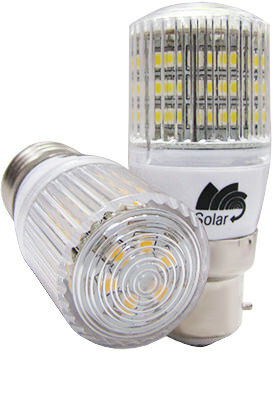 The 3W LED bulb provides a very useful light source which is a near equivalent to a regular 20- 25W domestic incandescent lamp with a massive 220 lumens! Ideal lighting for anywhere requiring to work with a 12v or 24v dc supply. 1) ES / E27 - Centre contact is + positive B22 and SBC anf G9 are not polarity dependent. 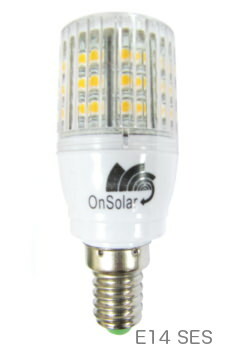 A powerful 3 WATT LED lamp suitable for many lighting applications using a 12v or 24v DC power supply. Ideal for areas requiring power efficient lighting such as: Remote Workshops, Marine and 'off grid' Solar powered homes, Caravans and remote locations such as Farm buildings, Barns and Stables and portable camping lamps. 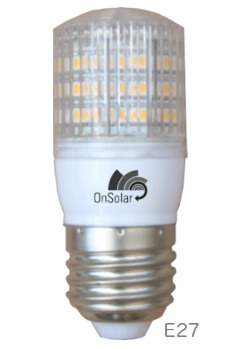 Our new OnSolar 3w Various common base fitting options are available, see details below for sizing and such.